This was originally intended to be released on either B&C Records or Charisma as the vinyl has the original CAS-1046 matrix stamped into the deadwax and then crossed out. It has been replaced by the PEG-6 matrix. My guess is that given the very traditional, folk music on the LP it would have sat better as part of the B&C catalogue. Comes with a nice gatefold sleeve that replicates the style and lettering of Jackson Heights’ Ragamuffins Fool sleeve design – Grahame Berney designed the Jackson Heights sleeve in autumn 1972 so this sleeve, designed by Davis/Berney/Wade, predates it by about 1 year. 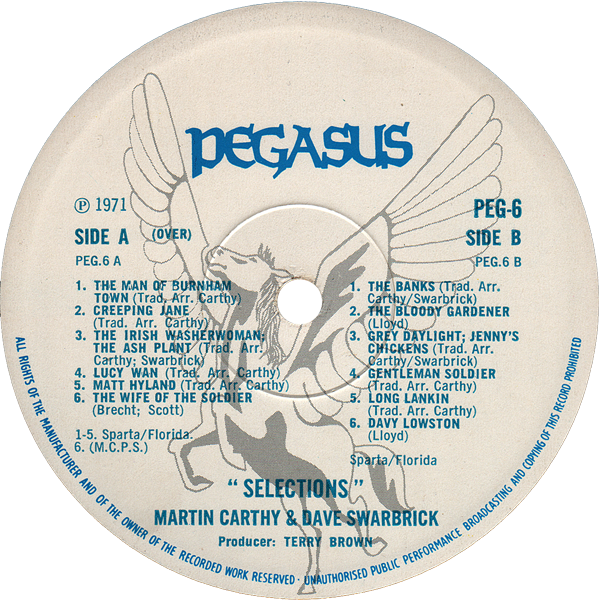 Martin Carthy appears on the Vertigo sampler, “Heads Together First Round” 6360 045 in autumn 1971, but didn’t get to release anything on the swirl label (imagine the value now if he had…).